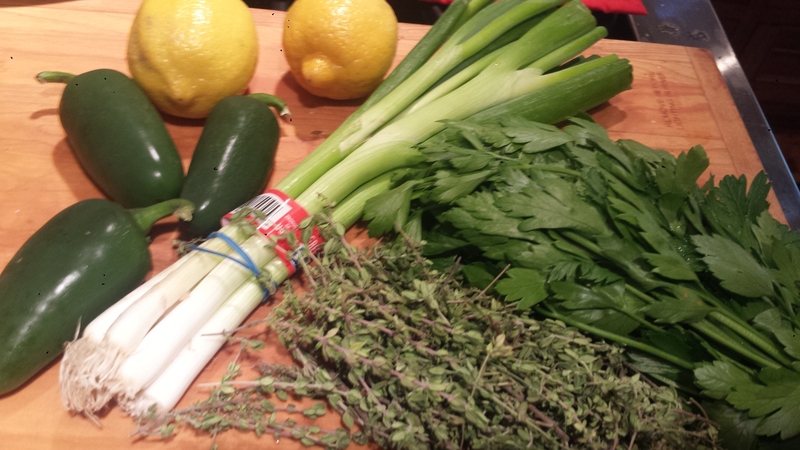 HERE is what’s on the grill this weekend. It’s EASY, FAST AND YOUR GUESTS WILL LOVE YOU! I am eating more plant based foods and less seafood these days but salmon is still a favorite. This version is roasted or grilled over high heat and topped with a deliciously spicy Italian Salsa Verde aka Magic Green Sauce. 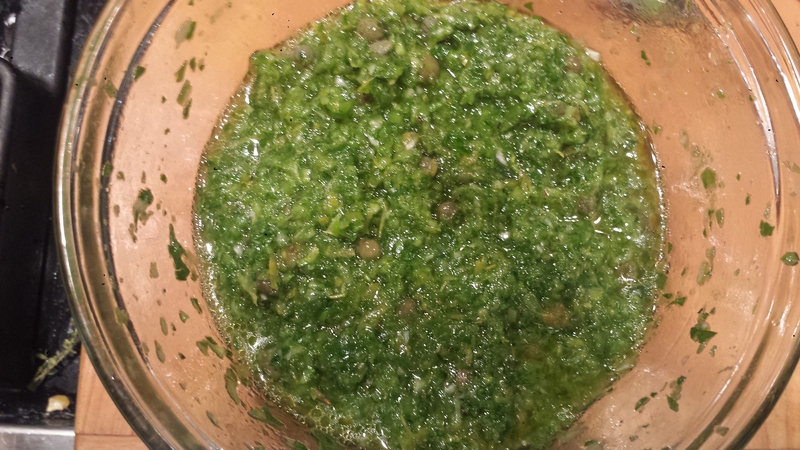 I can’t say enough about this tasty green sauce made with fresh parsley, thyme and jalapeno peppers combined with capers, lemon and olive oil. Yum! This amazing sauce would be great on anything grilled or roasted, including veggie skewers or tofu. It’s that good! 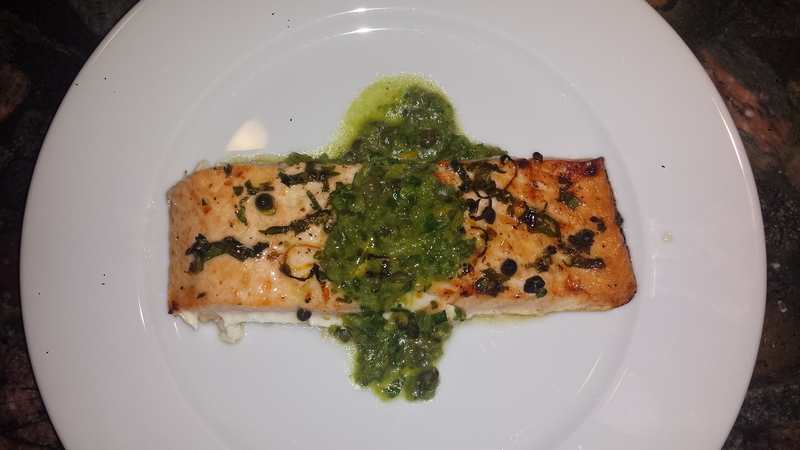 The beauty of this preparation is that once you have made the green sauce and sprinkled the salmon with fresh herbs, scallions, capers and lemon, all of which only takes about ten minutes, it can all sit until you are ready to cook. Refrigerate if you won’t be cooking for a while. I was curious, so I let my fingers do the walking. According to FDA , ‘raw seafood can sit at room temperature for no more than 2 hours or 1 hour if room temperature is 90 degrees or more.’ Then when you are ready, just pop the salmon into a hot oven or grill and in ten minutes or less – perfection! 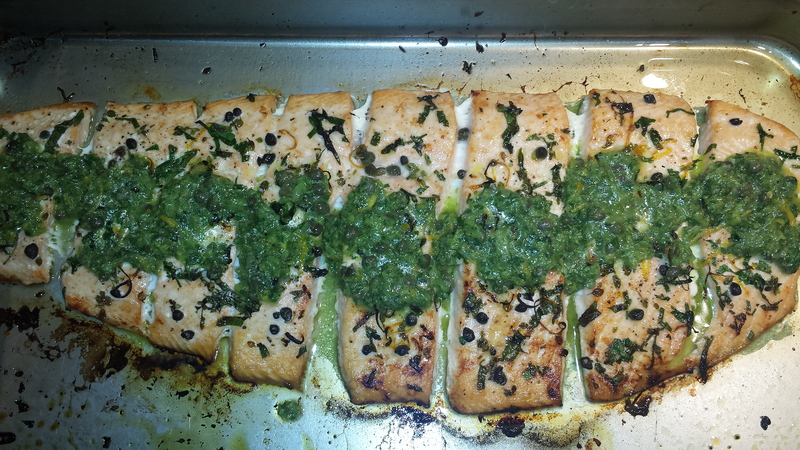 I have made this salmon preparation several times now. The first time I grilled it skin side down on a hot grill. I was just cooking for my family and forgot to take photos before we ate, but once I tasted the results I knew I would be making again and again. The next time I roasted two sides of salmon with salsa verde for a party of about 16 women. It was a 90 degree day in a house with no air conditioning so I decided to roast the salmon on the grill and not heat up the kitchen any further. Since I was dealing with two large unwieldy sides of salmon, I roasted them in the roasting pan right on the grill with great results. With the lid closed, the grill became an effective outdoor oven. The salmon in these photos was skinless which I roasted in the ovenat 450 for about five minutes and then broiled for several more minutes. All three cooking techniques yielded great results, so take your pick. TIPS: I recommend pre-slicing the salmon before cooking for ease of serving and presentation. 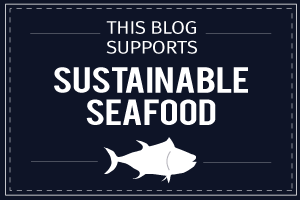 Often a side of salmon gets hacked up by well intentioned people trying to serve themselves. By making cuts ahead of time, you ensure that each slice is perfectly sized for your crowd and ready to serve. If the skin is on, you don’t have to slice through the skin which can be very tough to do. The cooked salmon will slide right off the skin. Salmon can be grilled or roasted in several ways. If the skin is on, salmon can be placed, skin side down, on a hot grill and cooked with the lid closed 8 to 10 minutes. 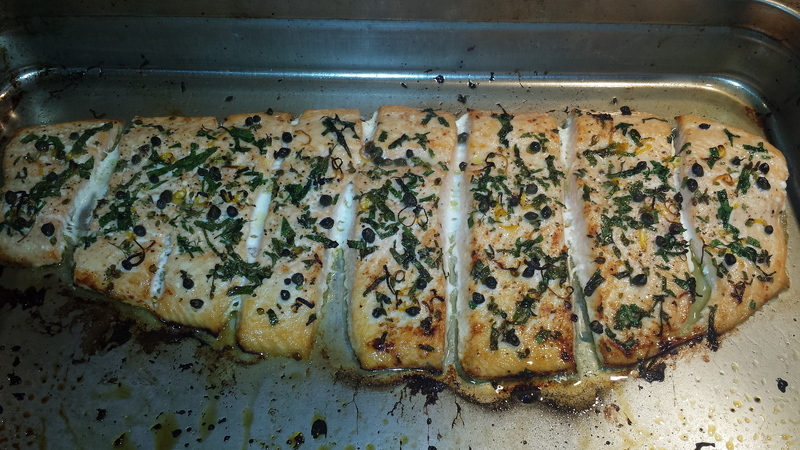 Salmon without the skin is easy to roast in the oven at 450 for about 5 minutes and then broiling several more minutes. Salmon can also be roasted on the grill, which is great on hot summer days when you don’t want to heat up the kitchen. Just heat the grill until very hot and then place the salmon in the roasting pan in the grill and cook with the lid down 8 to 10 minutes. To prepare the salsa verde most easily, process the scallions, thyme and chilis in a food processor until finely minced. Or finely mince by hand with a sharp knife. Add olive oil and process until smooth. Transfer to a small bowl and add capers, lemon juice and zest, salt and pepper. Set aside. 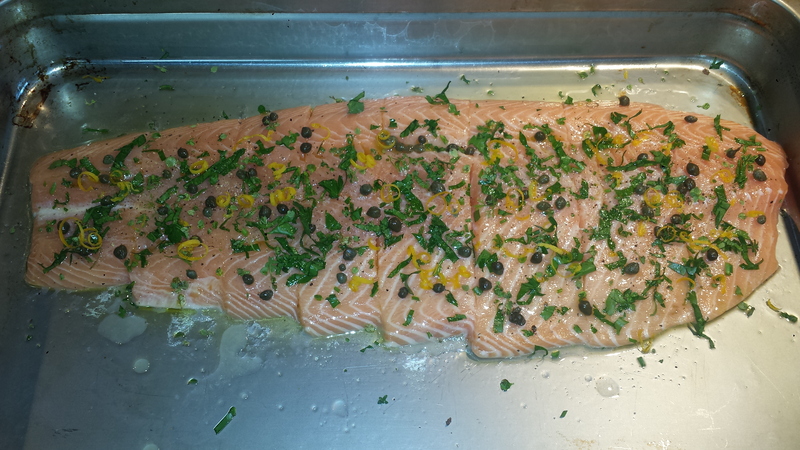 Brush salmon with olive oil and sprinkle with thyme, parsley, scallion, capers, lemon juice and zest. Grill skin side down on high heat with the lid down 8 to 10 minutes. (Or alternately, see TIPS for oven roasting options) Salmon is done when top is golden, slices start to pull apart and fat collects on top. Don’t overcook. Remove from heat and drizzle with some of the salsa verde. Serve with more salsa verde on the side. To prepare the salsa verde most easily, process the scallions, thyme and chilis in a food processor until finely minced. Or mince by hand. Add olive oil and process until smooth. Transfer to a small bowl and add capers, lemon juice and zest, salt and pepper. Set aside. 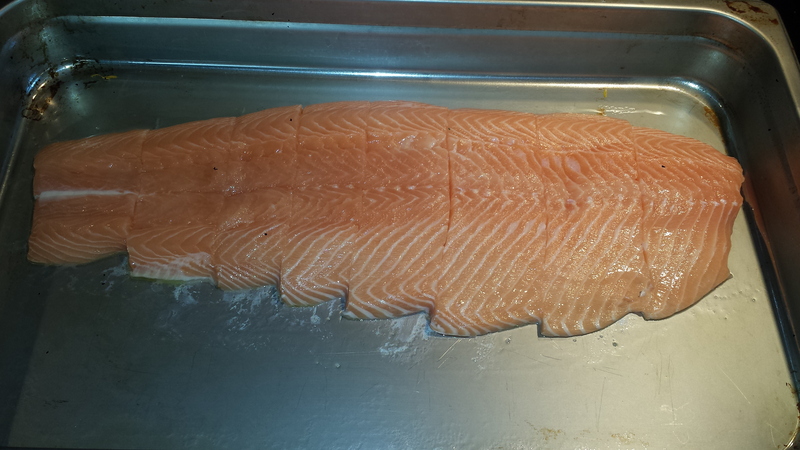 Rinse and dry the salmon and place on a large platter or aluminum foil skin side down. Pre-slice individual portions if desired. 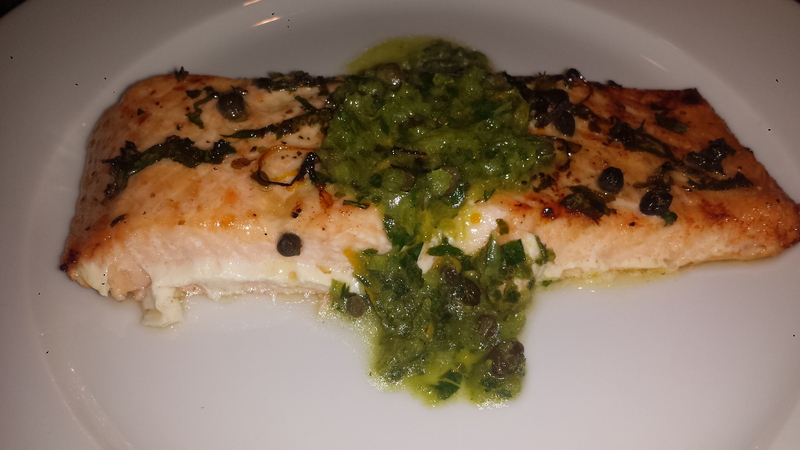 (You don’t have to cut through the skin) Brush salmon with olive oil and sprinkle with thyme, parsley, scallion, capers, lemon juice and zest.